In the wake of allegations that the Russian government used social media and other tactics to disrupt the 2016 United States presidential election, roughly seven-in-ten Russians believe their government did not try to influence the election. Only 15% say their government did try to meddle, a new Pew Research Center survey shows. More broadly, Russians are about evenly split over whether their country tries to influence the internal affairs of other countries: 45% say yes, 46% say no. In contrast, an overwhelming majority of Russians (85%) think the U.S. government interferes in the domestic affairs of other countries. Regarding relations with the West, roughly eight-in-ten Russians think that Western sanctions, initially imposed on account of Russia’s annexation of Crimea from Ukraine in 2014, are having an effect on the Russian economy, with 47% saying the sanctions are having a major effect. Tensions with the West are palpable for many Russians: Eight-in-ten consider NATO a threat, with 45% saying the organization is a major threat to their country. Globally, Russians believe their country is playing an increasingly important role. Nearly three-in-four (72%) think Russia plays a more important role in the world than it did 10 years ago, up from 59% last year. Most, however, also believe Russia does not get the respect it deserves. About six-in-ten say Russia should get more respect internationally than it does, with roughly half as many (32%) saying Russia is as respected as it should be. Russian President Vladimir Putin retains the confidence of his people in handling international affairs. A majority (58%) has a lot of confidence in his abilities, with an additional 23% expressing some confidence in him. Only 14% have little or no confidence in their leader’s international acumen. Domestically, a slim majority of Russians are satisfied with the direction of the country, even as four-in-ten express dissatisfaction. Economic issues top the list of Russia’s biggest problems, with nearly seven-in-ten (69%) saying inflation is a very big problem. Additionally, majorities are very concerned about unemployment and inequality. Despite the positive feelings for Putin and their country, 59% say corrupt political leaders are a major concern in Russia today. These are among the findings of a Pew Research Center survey conducted among 1,000 respondents in Russia from May 22 to June 23, 2018. The survey was nationally representative and occurred mostly before the start of the FIFA World Cup, as well as the government’s proposal to increase the retirement age, which has caused some political backlash against Putin and the government. Older Russians are more convinced that the government did not meddle – 77% of Russians ages 50 and older say this, compared with 66% of those under 50. When asked about the possibility of influencing the internal affairs of other countries, Russians are divided on their own government’s actions. Nearly equal numbers say the Russian government mostly stays out of the internal affairs of other countries (46%) as say it does try to influence other nations (45%). Young Russians (ages 18 to 29) are more likely to say Russia tries to interfere abroad (56%) than those 50 and older (41%). Those Russians who lack confidence in Putin are also more willing to say Russia tries to influence other countries (63%). However, Russians clearly see the U.S. as an interfering power, with 85% saying the U.S. tries to shape the internal affairs of other countries versus only 9% who say the U.S. stays out. 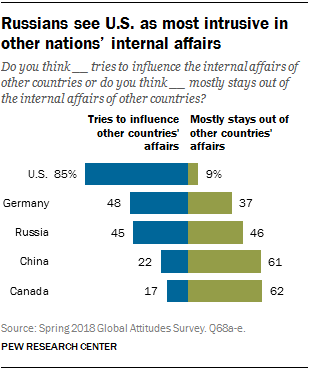 In looking at other countries, roughly six-in-ten in Russia say that Canada (62%) and China (61%) avoid meddling, but 48% say that Germany does try to influence the affairs of other countries. Most Russians say that Western sanctions are having an effect on their economy, and nearly half (47%) say it is a major effect. This concern is little changed from surveys in 2015 and 2017. Relatedly, 80% of Russians see NATO as a military threat, with 45% stating it is a major threat. Similar sentiments toward the organization were shared in 2015 and 2017. 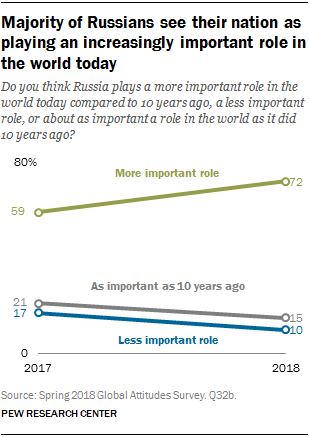 Russians are increasingly likely to say their country plays a more important role in the world today than it did 10 years ago. Overall, 72% of Russians say this now compared to 59% who did in 2017. Only 10% believe Russia is less important. Russians who are confident in Putin’s handling of global issues are much more likely to say their country plays a more important role in the world today (79%) than those who lack confidence in their president (41%). When it comes to international perceptions of Russia, a majority of Russians say their country should be more respected around the world. 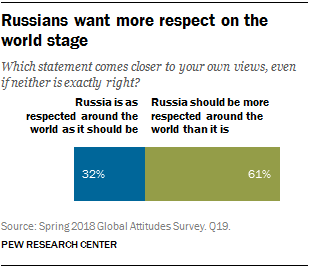 Roughly six-in-ten (61%) say Russia does not get enough respect, with only about half that (32%) saying Russia is as respected around the world as it should be. These sentiments are largely unchanged since 2017, but since 2012, feelings that Russia is as respected as it should be have doubled. 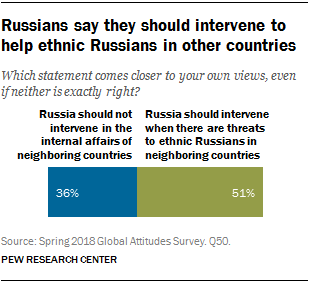 About half of Russians (51%) say their country should intervene in neighboring countries if there are threats to ethnic Russians there. People who express confidence in Putin are more likely to support such interventions (55%) than are those who have little or no confidence in the president (36%). President Putin remains a popular figure in Russia. Roughly eight-in-ten Russians (81%) have at least some confidence in his ability to handle international affairs, with 58% expressing “a lot of confidence.” Confidence in Putin has been especially high, and intense, since 2014, the year Russia annexed Crimea from Ukraine. Putin retains high levels of confidence among all age groups and education and income levels, as well as both men and women. 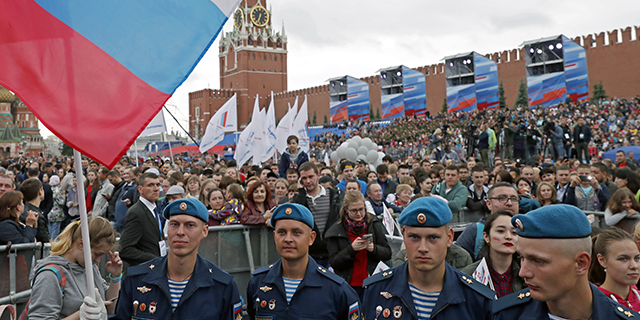 However, those who have a favorable view of his political party, United Russia (Edinaya Rossiya), are almost unanimous in their confidence in his international leadership (94%). Along with confidence in their leader, a majority of Russians are also satisfied with the direction of their country. In 2018, 57% of Russians say they are satisfied with the way things are going in Russia today, compared with 40% who are dissatisfied. Russians have been satisfied with the current state of the nation since 2014, but before then, stretching back to 2002, Russian attitudes were generally more negative about the direction of the country. Those who have confidence in Putin are about three times as likely to say the country is going in the right direction (63% satisfied) compared with those who lack confidence (20%). Despite satisfaction with the country’s overall direction, the Russian public still sees a bevy of problems. Among these, economic issues are the most pressing, especially inflation: 69% say rising prices are a very big problem for Russia. An additional 25% say inflation is a moderately big problem, meaning that 94% of the public is concerned about the issue. Other economic issues near the top in the survey are income inequality and a lack of jobs, with 57% of Russians saying these are very big problems. Inequality, in particular, is considered a bigger problem among Russians ages 50 and older (66% say it is a very big problem) and those whose income is below the country median (62%). Corruption among the political elite is also a pressing concern among Russians, with 59% saying it is a very big problem. Concern about corruption is especially common among people who lack confidence in Putin (of whom 69% see it as very big problem) or do not support United Russia (67%). Fewer Russians are concerned about corrupt business leaders (44%). Terrorism is an issue that garners acute concern from more than half the populace (53%). 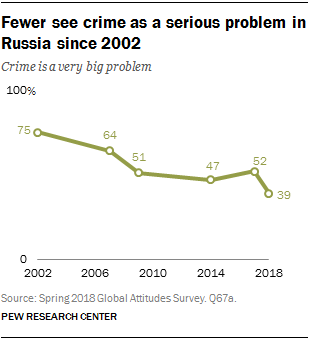 Crime, however, is less of an issue in Russia than in previous years, with only 39% saying it is a very serious problem. In 2017, 52% said it was a top concern, which was already significantly lower than the three-quarters of Russians who were very concerned in 2002. On the bottom end of concerns in Russia are immigration and conflict between ethnic and nationality groups. Only 26% and 20%, respectively, name these as very big problems.